General Information: Broccoli is harvested before the buds begin to blossom. This vegetable is a relative to cauliflower, cabbage, and Brussels sprouts. The head of branching florets and approximately 6 inches of the stalk are the edible parts of the vegetable. It is one of the most versatile of vegetables grown and can be eaten raw or cooked. 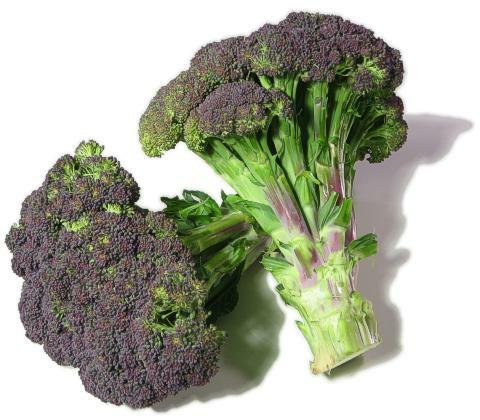 Purple broccoli is very similar to sprouting broccoli except its florets have a purplish color to them. Instead of being a blue-green, purple broccoli is more of a purple-green. It tastes like broccoli but has a little more antioxidant value. Nutritional: Broccoli truly is a wonder vegetable. Only 25 calories and broccoli is high in vitamin A, and is a good source of folic acid, calcium, potassium, vitamin C and beta-carotene (an antioxidant). It is packed with antioxidants. It also contains the phytochemical sulforaphane, a natural chemical that stimulates the body to produce enzymes which destroy carcinogens, and therefore which can help reduce the risk of cancer. Johns Hopkins University study showed that Broccoli is more effective than antibiotics for peptic ulcers and stomach cancer. This is a cruciferous vegetable. Applications: The leaf, stalk and florets can be eaten raw or cooked. Raw, it is eaten on its own accompanied by a dip or cut up and added to salads. When cooked, it can be eaten as a side dish, alone or topped with a sauce, such as au gratin, hollandaise, or Mornay. It is also often added to other dishes, such as stir fries, pasta, quiches, omelets, soups, and stews.